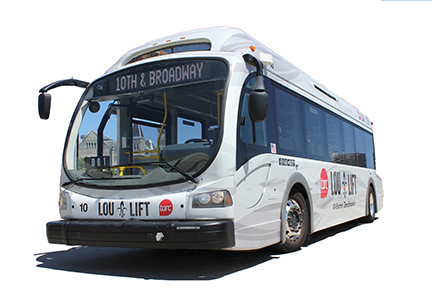 TARC’s free, all-electric ZeroBus has been renamed LouLift with extended service stretching from Central Ave to the Galt House downtown. LouLift shuttles now run daily every 20 minutes (30 minutes on weekends) along 3rd St. from the Patterson baseball stadium to the Speed Museum, connecting Belknap campus directly to Old Louisville & downtown destinations such as Central Park, Simmons College, Spalding University, LFPL Main Library, the Convention Center, and the KFC Yum! Center. The redesign of the fare-free ZeroBus service, in partnership with the Louisville Convention and Visitors Bureau (LCVB), provides improved access between downtown hotels and businesses and major destinations, including the University of Louisville and the Speed Art Museum. TARC’s nine blue and green ZeroBus vehicles are getting a new black, white and silver color scheme prominently displaying the LouLift logo. New stops have been added at Churchill Downs, the University of Louisville's Belknap Campus (at Eastern Pkwy), the Speed Art Museum, St. James Court and other attractions south of Breckinridge Street. The design change to LouLift is being phased in on buses, shelters and stops over the next few weeks. This approach avoids service interruptions as the old design is removed and the new one applied to each bus. The new design is scheduled to be on all the buses by July 1, 2018. LouLift will operate on the same two corridors that the ZeroBus served: Main-Market and Fourth Street. The Main-Market Route #77 operates in a loop, west on Main and east on Market between Wenzel and 10th streets from 6 a.m. - 8 p.m. on weekdays and 10 a.m. - 6 p.m. on Saturday. Since June 3, the Main-Market Route #1 has operated between Churchill Downs on the south and the Galt House turnaround on the river on weekdays from 7 a.m. – 7 p.m. and from 10 a.m. – 6 p.m. on Saturday and Sunday. TARC rolled out the ZeroBus service in Januar 2015 to replace historic replica trolleys, becoming one of the first transit agencies in the country to add all-electric buses to the fleet. Though LouLift is a free service to UofL visitors and everyone, the entire TARC system is free to all UofL students, staff, and faculty. Just show the driver your UofL ID as you board any TARC bus! More information about all UofL Transportation Alternatives is online here.